The first people to use pillows were those who lived in early civilizations of Mesopotamia around 7,000 BC. During this time, only the wealthy used pillows. The number of pillows symbolized status so the more pillows one owned the more affluence he or she held. Pillows have long been produced around the world in order to help solve the reoccurring problem of neck, back, and shoulder pain while sleeping. The pillow was also used to keep bugs and insects out of people's hair, mouth, nose, and ears while sleeping. Pillow use has been associated with the mummies and tombs of ancient Egypt dating back to 2055–1985 B.C. Ancient Egyptian pillows were wooden or stone headrests. These pillows were mostly used by placing them under the heads of the deceased because the head of a human was considered to be the essence of life and sacred. The ancient Egyptians used these wooden or stone pillows in order to provide support to a corpse's head, uphold body vigor, keep blood circulating, and keep demons away. The Romans and Greeks of ancient Europe mastered the creation of the softer pillow. These pillows were stuffed with reeds, feathers, and straw in order to make them softer and more comfortable. Only upper-class people typically owned these softer pillows, however all classes of people were allowed to use some type of pillow while sleeping in order to give them support. People in ancient Europe started to use pillows when going to church in order to kneel on while praying and to place holy books on. This is a tradition that still lives on today. Additionally, the Romans and Greeks used their pillows by placing them under the head of those deceased just like the ancient Egyptians did. Chinese pillows were traditionally solid, though sometimes used with a softer fabric over them. Over many Chinese dynasties, pillows were made from a wide range of materials including bamboo, jade, porcelain, wood, and bronze. Ceramic pillows became the most popular. The use of the ceramic pillow first appeared in the Sui Dynasty between 581 and 618 while mass production appeared in the Tang Dynasty between 618 and 907. The Chinese decorated their pillows by making them different shapes and by painting pictures of animals, humans, and plants on them. One common type of pottery used was Cizhou ware. 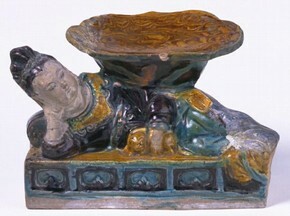 Chinese ceramic pillows reached their peak in terms of production and use during the Song, Jin, and Yuan dynasties between the 10th and 14th century, but slowly phased out during the Ming and Qing dynasties between 1368 and 1911 with the emergence of better pillow making materials. Who on earth would you like to sleep on a ceramic pillow? According to this article, the author speculates that they were used to encourage a better sleeping position for the body, or to maintain the highly complex hairstyles worn by women during the Ming dynasty. Other reason might have been that the material qualities of ceramics were thought to have health benefits for the sleeper, and that bed pillows were thought to influence and guide dreams in the hope of producing male heirs. It will save you money. But bed pillows are not expensive, and even though every cent counts in the end, you shouldn't sleep without a pillow just to save money. It will lead to less neck, back, and shoulder pain, higher quality sleep, and even fewer wrinkles. It improves sleep quality and fits more physiologically and mechanically with the natural curve of the cervical spine. Sleeping on your back without a pillow changes your neck angle from its normal daily position. When standing, your neck also has a certain curve to it. If you sleep on your back, that curve is also distorted. So if you sleep without a pillow you will get a higher quality sleep, and if you are sleeping with a pillow it will improve sleep quality? So instead of listening to articles that argue back and forth, the human guinea pig in me decided to experiment to sleep without a bed pillow. Three weeks have now passed, and I can say that I'm not missing my pillow. I feel a little bit more rested, I feel that my posture has improved, and my neck hasn't begun to hurt even though I sometimes sleep on the side. One of the articles argued that "Sleeping on your back without a pillow changes your neck angle from its normal daily position," but if the bed is soft, won't that compensate for it? Anyway, it's hard to tell after just three weeks because other conditions might have changed, such as the weather. It's a little bit cooler these days and that might have made me feel more rested. So I might do a follow-up to this article in a few weeks.